Maybe you’ve seen Buttercup and Bert out and about Calgary delivering smiles and plenty of good times this summer. OR maybe you’ve seen us featured in the news. Recognized for our unique take on the Photo Booth craze, we have dialed up the game by truly bringing “pictures to the people” (as we like to say). A photo speaks a thousand words, especially when it is branded and styled unique to your event, and instantly shared on social media! As an event planner, an important step in the planning process is figuring out what makes your event different and better yet, figuring out how you will get people talking about it. Jo Williams and Monique de St. Croix, the owners of Hip Image, have the perfect solution, a 1972 Volkswagen cargo bus named Buttercup! While you’re at it, take a look at some of the photos from the Moments Refresh launch party where we officially launched Bert the Boler. He looks so short in comparison to his tall company here! Thank you to Lisa Gareau, publisher of Moments Magazine and founder of Candy Event Consulting for including our story! Bert the Boler behind one very tall lady! 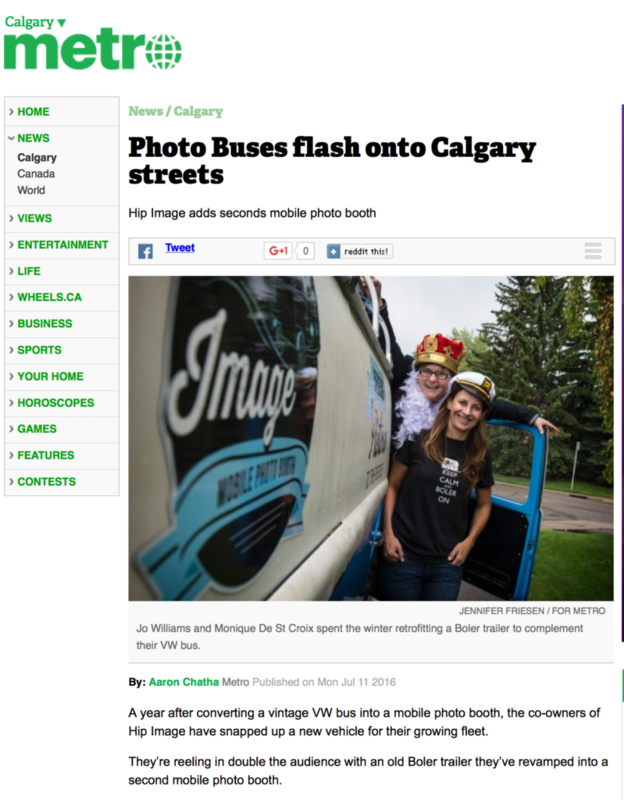 We were equally as thrilled to see our faces on the front page of Calgary Metro on July 11th by Aaron Chatha. Read an excerpt from the article below. Click here to read the full story. A year after converting a vintage VW bus into a mobile photo booth, the co-owners of Hip Image have snapped up a new vehicle for their growing fleet. They’re reeling in double the audience with an old Boler trailer they’ve revamped into a second mobile photo booth. “They’re funky, they’re appealing, they’re like a piece of candy,” laughed co-owner Jo Williams. And many patrons might just feel like a kid at a candy store, as when the buses pull up, they come with a bevy of hats, wigs, glasses, fake lips – horse heads – and even weirder stuff. 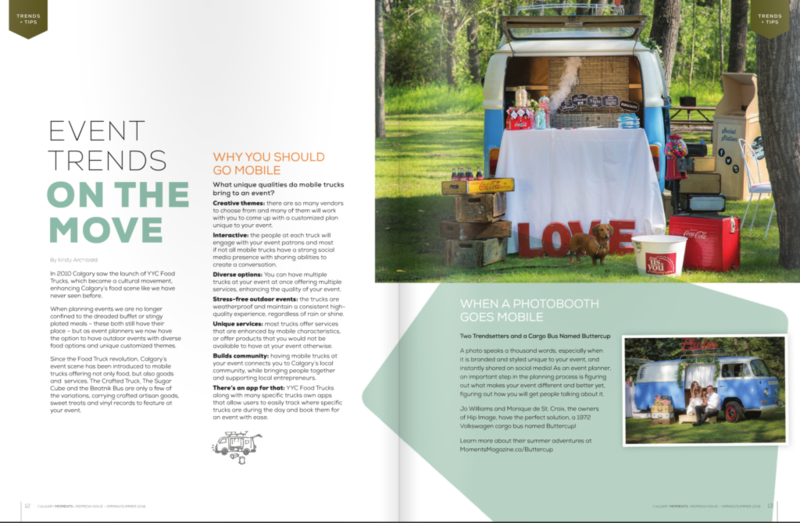 Aimed at creating a fun experience at events, a photo booth – even a mobile one – stands out in an era where a selfie is only a button click away. Photographer and co-owner Monique De St Croix said it’s about the experience. “The way that we have it set up is full of nostalgia and fun,” she said. 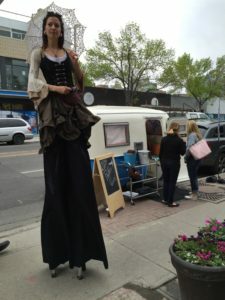 Watch for more of Hip Image showing up at events in around Calgary throughout the summer!